You will then scroll down the page and select “Start neuropsych test”. A new screen will pop up with similar instructions. At this point, the patient may place their hands on the spacebar and get ready to begin. It is strongly advised that parents leave the room to ensure all results are accurate and that the patient can be fully focused on the test. The patient will begin with a one (1) minute practice test. The test administrator should be present for this portion of the test. During the practice test, observe the respondent carefully, to determine whether they are ready or should practice again. A warning message will be issued if omission rates are higher than 25 percent. If the warning appears, choose the “practice again” option and re-explain the instructions to the respondent before repeating the practice test. Be sure to re-explain what they must do before starting it again. The practice should be repeated only if necessary; doing so may prolong testing time and cause fatigue before the respondent begins the actual administration. If task comprehension does not improve after three attempts, consider forgoing the actual administration. Once you initiate the full test, no more questions may be asked. It is important that no one disturbs the patient during the actual test. During this portion, you may leave the room. If you leave the room, set a timer to avoid the risk of returning to the room too soon and interupting the test. PLEASE NOTE The patient will NOT be able to back out of the screen and see other patient data while you are away. To close out of the test, you need a password. If the patient becomes distracted and gets off task say, “Remember, you have to try paying attention the whole time.” If your patient disengages again, no further prompt should be given. The program may be terminated by pressing Ctrl + Q + Q simultaneously on the keyboard. 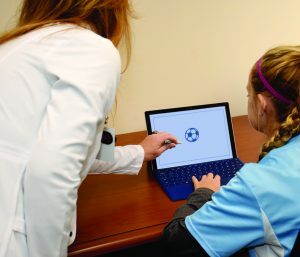 The password needed to return to the SportGait Medical App is “mhs“. You can find this password on your reference sheet. Make a note of any irregularities from the standardized administration that may have occurred during the assessment, including any warning messages displayed by the program during the administration, including time difficulties, an unusually low number of correct responses, and/or an unusually high number of Omissions. PLEASE NOTE The scoring requires a minimum number of responses. If the minimum number of responses was not met, then some or all of the scores may be unavailable on the reports.